Should Vermonters be alarmed by this report? For Vermonters, a primary message of the CDC report is: If you want to be concerned about a vector-borne disease in Vermont, be concerned about Lyme disease. For the last decade, the probability of contracting Lyme from a tick bite in Vermont has been at least 100 times greater than contracting any disease from a mosquito. Between 2004 and 2016, annual cases of Lyme in Vermont increased from 50 to 761, and the CDC suggests that additional unreported cases might increase those numbers tenfold. Vermonters should learn about Lyme disease and know how to avoid it. There has not been a similar increase in the number of cases of mosquito borne diseases in Vermont. The first cases of West Nile virus (WNV) and eastern equine encephalitis (EEE) in Vermont were in 2011 and 2012 respectively. There have been a total of only two cases of EEE in Vermont and eight cases of WNV, and there is no indication that the number of cases is increasing. The headlines highlighting a “tripling” of diseases in the US are accurate only if you include Puerto Rico. That’s because Puerto Rico tragically suffered some 40,000 cases of Zika in 2016. This spike is evident in the two graphs below. Above: The big number of cases in 2016 is due to 40,000 cases of Zika in Puerto Rico. The rise elsewhere in the US is not so striking (Zika is not transmitted by mosquitoes in the US north of Florida and Texas). Most of the cases included in the graph above are tick-borne, not mosquito-borne. Source. Above: This is the same data as in the previous figure. Most of the cases included in the CDC report are tick-borne diseases (light blue). The outbreak of Zika in Puerto Rico in 2016 is represented by the large medium blue bar in 2016. Note the relatively small number of cases of mosquito-borne diseases in US states (dark blue) and the modest increase over time since 2004. Source. The CDC report cites a 2017 study of local organizations, including insect control districts, that are responsible for controlling disease vectors. Many of these organizations are chronically underfunded, and most of them are lacking in at least one core competency required to effectively protect the public. The most common shortcoming was testing for insect resistance to the pesticides applied. Making reliable surveys of insects was the third most common shortcoming, and basing treatment decisions on those surveys came in second. 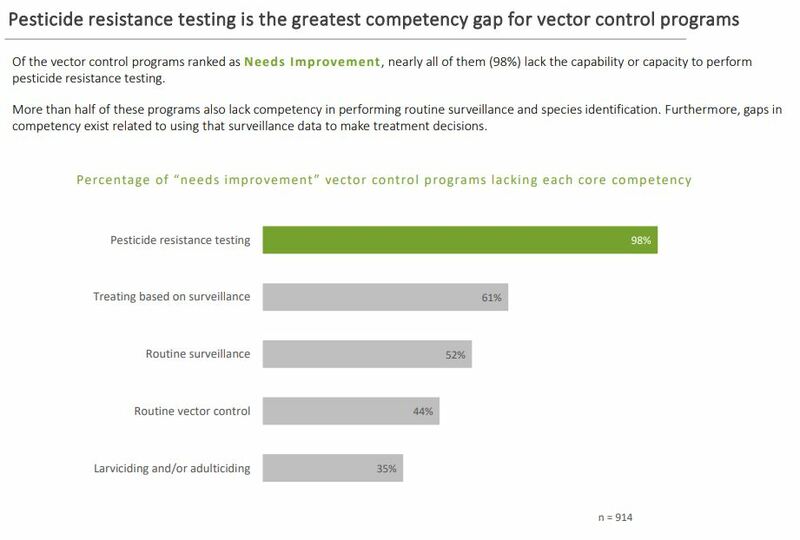 Above: The local organizations tasked with controlling disease vectors are lacking at least one core competency. Source. 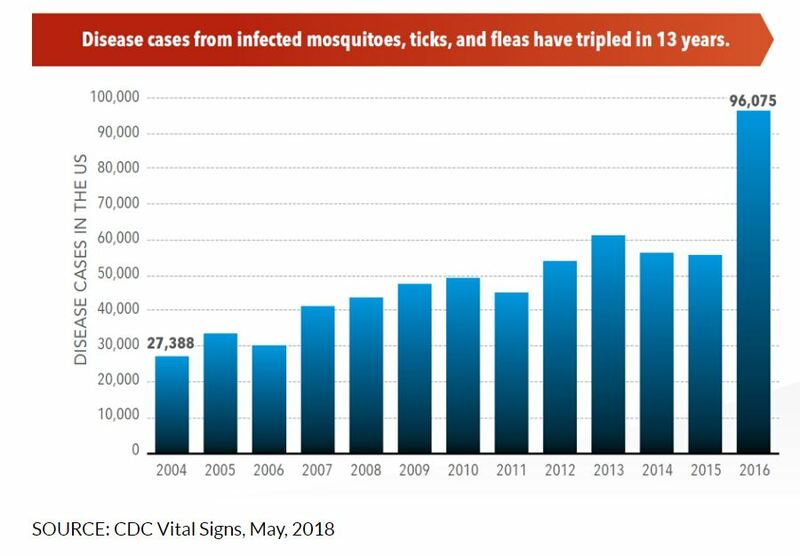 Although cases of Lyme disease have seen a steady increase over 13 years, mosquito-borne diseases like WNV and EEE are more prone to short term outbreaks, often followed by many quiet years. Scientists are not able to predict the outbreak years, so monitoring for the presence of WNV and EEE in mosquitoes is critical. When the next big year happens in Vermont, we hope the Vermont Department of Health is up to the task.